When it’s raining outside and you are too wimpy to go backpacking in it, you go through your gear, weighing everything in preparation for the obligatory gear checklist. And of course, the picture of your possessions in the House on Your Back. On the gear spectrum, I tend to fall near the ultralight folks but I am willing to make compromises for comfort and convenience and I readily admit this list is somewhat flexible. I own no Cuban fiber. But just for kicks, I did cut the handle off my tooth brush and I have been known to trim the borders off my maps. The Big Three – 6.3 lb. I am very pleased with how the big three (pack, tent, sleeping bag) ended up. My ULA Catalyst is roomy for the bear can but I took out the plastic back support saving a pound. I made the investment in a Western Mountaineering down bag and it was a good one. I’m not yet convinced quilts have that much of an advantage, at least not enough to invest in one to save about 6 oz. The one compromise was the tent over a tarp. Ease of setup and built in bug protection carried the day. The REI Quarter Dome one came in at only 2 lb. 2 oz. amking it the secound heaviest piece of gear. I am still debating over my sleeping pad. The Ridgerest is light but my old bones sure appreciate a self-inflatable. That would add about 6 oz. The Kitchen – 3.8 lb. Here is where I will find out if anyone reads this stuff. I DON’T GET THE ALCOHOL STOVES!!! Check my previous article where I did a performance test between my super light and reliable MSR Pocket Rocket and my homemade alcohol stove. My conclusion was whatever few oz. you spend on a stove/canister more than compensates for the amount of time… and fuel… it takes to heat water with alcohol. The bear can is the obscene weight hog here at 2 lb 11 oz. The rest of the kitchen is 1.1 lb. The Closet – 3.9 lb. I guess the biggest question here is whether to take the set of long johns. They weigh almost a pound. I like sleeping in them, even in the summer because they keep my bag clean. I could save a half pound by using just the tee shirt and leaving the top. The rain gear serves as wind protection. The pants may get left home though since I tend to wear long pants hiking. I don’t really need long johns AND rain pants for warmth. The biggest weight here is my first aid kit at just over a pound. It contains first aid stuff, personal grooming, sunscreen, Vitamin I (ibuprofen), fire starter, duct tape etc. I could shave an ounce or three here but I’m pretty good. This is my biggest debate over weight. I love my Sony Alpha 6300 mirrorless camera. It takes most of the pictures you see in this blog. The iPhone does a great job and served me well in the Grand Canyon two years ago. Plus they now make some pretty cool lenses for it that are reasonably priced. My total base pack weight is 20 lb. so 3.4 lb. is a significant portion – almost 20%. I really don’t have to decide until I hit the trailhead, which is probably when I’ll make it. Plus, leaving the Sony at home would challenge me to shed one more pound to get to 15 lb base pack weight, which, with a bear can, would impress most any thru hiker on the PCT. This entry was posted in John Muir Trail, Philosopher's Guide on May 19, 2018 by blogginggazelle. 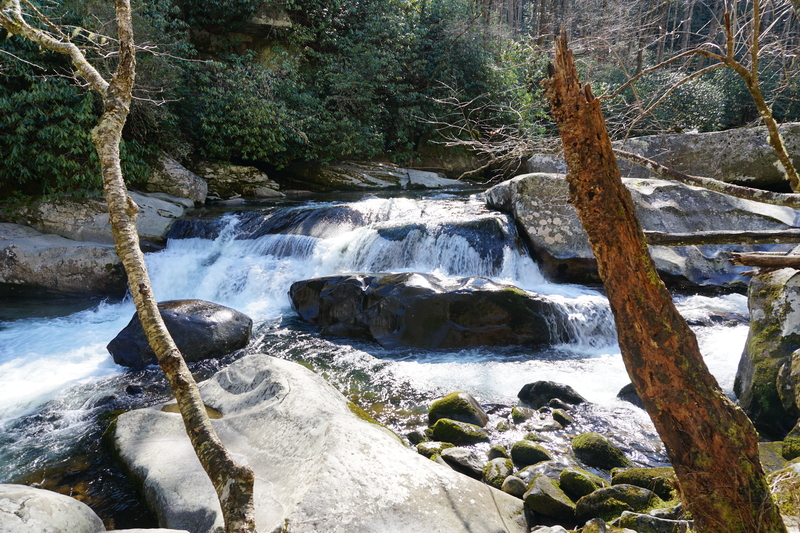 There are a number of things that make hiking out west different from hiking in the Smokies. Elevation is one thing. From what I can tell, I’ll be spending most of my time above 10,000 feet. Mt. LeConte is 6594′. 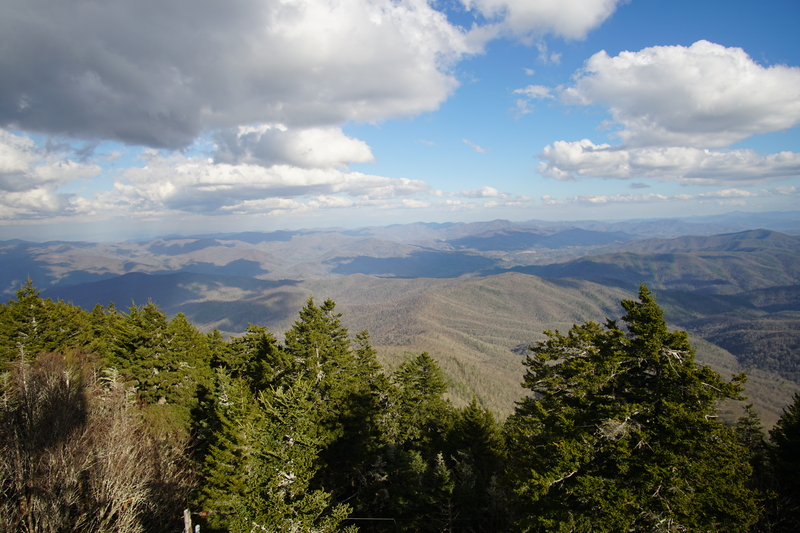 Clingmans Dome is 6644′. The tallest mountain in the east, Mitchell, is 6683′. At those elevations, one spends a lot of time in the Sierras above tree line, which occurs around 9,500′. No trees, no hammocks or bear bags. And no bear cables like we are accustomed to in the Smokies. But there ARE bears. To that end, the Park Service and the National Forest Service require bear canisters for storage of all smellables like food, toothpaste, sunscreen, deodorant (deodorant, really??? People take deodorant???). No one ever talks about whether body odor smells like food to bears or mountain lions. Bear canisters are available for rent, I have read, but I decided to go ahead and get my own. I chose the Bear Vault BV 500. I’m not sure what the “500” means. It holds 700 cu.in. or 11.5 liters and it’s 12.7 in high and 8.7 inches in diameter. And… it weighs 2lb 11 oz. REI price: $80. The upsides are it is guaranteed bear proof, although there are pictures in blogs where they have failed, you don’t have to hang a bear bag, and it provides a great seat upon which to rest while cooking dinner. At the end of the day, you just set the can 200 feet away from the tent and hope no one plays overnight soccer with it. The downsides – big and heavy and expensive. The BV 500 is among the cheaper options. They can go as high as $200 and weigh over 3.5 lb. All this light weighting I am trying to employ goes away when you add nearly three pounds of food container, making it the heaviest single item in my pack. And unlike a good water proof food bag, it does not get smaller when you eat the food. This entry was posted in John Muir Trail, Philosopher's Guide and tagged Bear Canister on May 18, 2018 by blogginggazelle. Had I not been able to see a thing, it would have still been a blessing because the chorus of birdsong rivaled anything ever composed by Handel or Rutter. Wanting to bathe myself in this rich aural moment, I rushed back in to get my ENO and a couple books appropriate to savor the moment, some Wendell Berry and some John Muir. The hammock secure, I nestled in and began to listen. To listen the way I used to when I mounted just the right record on my audiophile turntable and sat at the right angel to the speakers for optimal stereo separation and frequency response. Except today, there were no electronics. No technology. No anti static record fluid. An airplane droning across the sky A police siren, or maybe a firetruck? I became aware of my shame as I seemed to be an expert in the noise of man, yet I could barely mimic the birdsong, knowing nothing of the artist that shared it. My shame bore anger and the magic was gone. The ENO was stuffed in its sack, the books were gathered and I returned to my box and shut the door. At least it was quiet there, but the artificial kind of quiet that comes from a well insulated wall, not the stillness of a cool breeze whispering across a meadow. I wish I could be more like they are. This entry was posted in Encounter Creation and tagged Birdsong on May 16, 2018 by blogginggazelle. Strider’s JMT Itinerary (tentative) is Released! The permitting process allows for (requires?) a daily itinerary. Recalling my last post and the utter frustration one meets in trying to complete this process before a 5-minute timeout, only to find out the system accepts incorrect destinations once you are past your entry and exit point, I had to go back to fill it all in with the right stuff. So after careful research and planning out reasonable daily mileages I came to realize that most of the campsites are not available in the drop down menus of the permitting process so officially, I am spending most nights at a place called “other”. I really hope it’s nice and there’s water. As Patton said, “No battle plan survives first contact with the enemy,” which calls into question why one would even try to plan out an itinerary. My AT thru hike itinerary many years ago was pretty much blown up the first day. But the value in planning is not the end product, but the process of thinking through various strategies. In this case, where to re-supply. There are a number of resupply points along the first half of the JMT, but there is only one for the last half and that is at Muir Trail Ranch. Since I am actually entering the trail officially at Rush Creek, I only need 5 days of supplies to get to Muir Trail Ranch so I guess it’s just one re-supply for me. Much more on that later. My itinerary calls for 10 days of supplies from there to Whitney Portal. I am hopeful of beating this schedule to some extent as I generally hike 15 – 18 miles a day but there are a couple caveats – First, the highest mountains on the east coast are only 6,000 feet, while much of the JMT is above 10,000 feet. I am brushing up on those who have had bouts with altitude sickness and the general word is that hiking south, you get to acclimatize to some extent. The second issue is the specific exit date, which is required of the permitting process. Who knows what happens if you try to leave early… Do the rangers make you go back and wait it out or do they just write out a ticket? Who knows? I imagine this will be a topic of conversation once I am on the trail. At the very least, maybe I can save up some time for a zero day somewhere really nice. This entry was posted in John Muir Trail and tagged JMT Itinerary, John Muir Trail on March 28, 2018 by blogginggazelle. Springtime was on a preseason tour the first weekend of March and stopped for a couple days in the Smokies. One of the secret blessings of being a 900 Miler is you get to drive the though our beautiful park early on a weekend morning when the rest of the world is wondering why none of the breakfast places in Gatlinburg open before 9:00 am. The Little River was proudly sporting Class II rapids as the kayakers were gathering in the parking lot at the Townsend Y, donning winter wet-suits. Meigs Falls were in full glory and the fly fishermen were congregating near the bridge over the Oconaluftee on the Kephart Prong Trail. 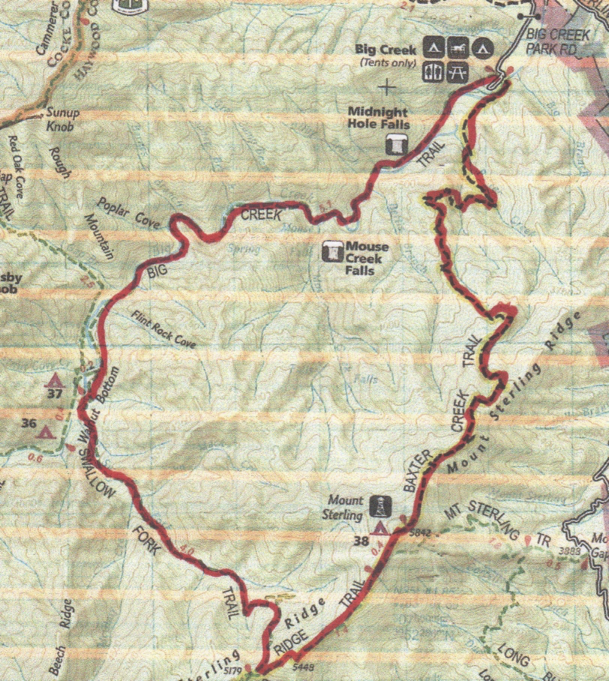 My target for the day: Newton Bald Trail. Newton Bald could be put together with the Mingus Creek Trail for a pseudo loop but you have to get from near the park entrance back to Smokemont or just walk it. In my case it was an orphan, having completed Mingus Creek so I decided on an out and back for the 5.5 miles. The first thing one should know about Newton Bald Trail is the fact that Newton Bald is not. The Wise Guide mentions that it used to be a bald years ago before the park but as the Brown Book says, there are no views except through the winter trees. The elevation profile in the Brown Book shows a scary climb at a 45 degree angle and it is a 10% grade gaining nearly 3,000 feet at 542 ft. per mile. That said, I found the climb steady but not particularly strenuous. The temperature had just passed 40 degrees as I started the flat section along Newfound Gap Road. The easy flat hiking was short lived as the trail bent left and started the 4 1/2 mile climb at 0.1 miles. The Newton Bald horse loop joins in a couple hundred yards in a wide gravel path before it turns left and the trail heads straight in a single track as the steady climb begins in earnest. 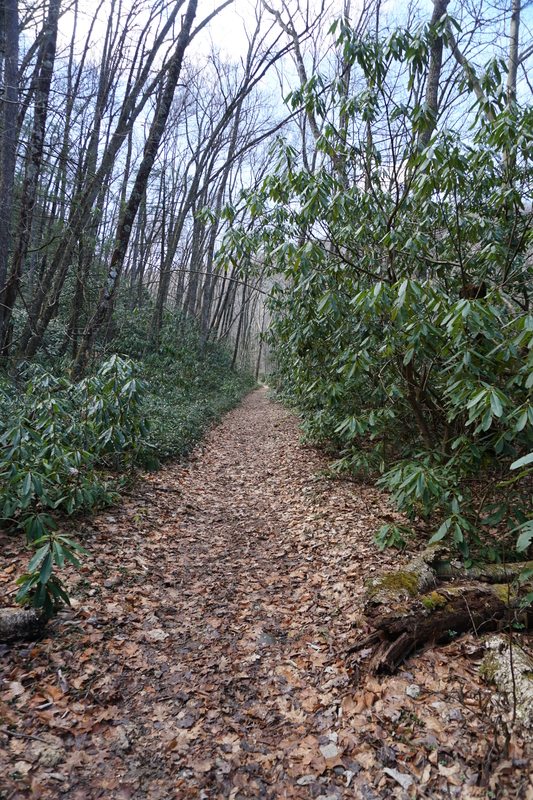 The early climb is through rhododendron and mixed hardwoods. The first discernible landmark is the first stream crossing at about 1.2 miles. There are a few bends in the trail along the way, some involving small streams in the springtime. On the one hand, the Newton Bald Trail is rather unremarkable with no views, no waterfalls and it is up hill mostly the whole way. Perhaps it was the great weather or joyful ride through the park putting me in a great mood, but I would call the hike rather pleasurable, despite the steady climb. The trail is well graded through forest that was clear of undergrowth and there are really no places where I would call the trail rugged; just a steady walk over a carpet of leaves. The streams are all rock hoppers and fortunately, only a couple small blow downs at this point in the season. The steady climb takes a break at about 4.1 miles for a hundred yards or so and continues up over Newton Bald at about 4.7 miles. Newton Bald is covered with mixed hardwoods. The guidebooks mention grasses and flowers evident in the warmer months but in winter, one is left wondering why the name “Bald” is involved, although shortening it to “Newtons” doesn’t make any sense at all. The trail levels out all the way to Campsite #52 at 5.3 miles and beyond to the intersection with the Thomas Divide Trail at 5.5 miles. I made the 5.5 miles in 2:03 for a pace of 2.19 miles per hour. Lunch and some mind out of time back at the campsite. The stillness was sublime with a hint of birdsong once in a while and the occasional low rumble of a jet engine leaving the McGee Tyson airspace. I wouldn’t call my mind out of time a nap because I really didn’t dose off but I did loose track of time in the warm sunshine listening to the faint, quiet sounds around me. Although it was warm and springlike, the wild world was still asleep and the earth felt that way. After an hour, or a moment, I’m not really sure, I was ready to head back. I am a pretty fast hiker, especially with well over 5 decades in my knees but the descents are never easy. But that is the beauty of Newton Bald trail. The steady decrease in elevation and the absence of stumbling rocks and roots made for a fast retreat. I made it back to the trailhead in 1:37 for a 3.4 mile per hour pace and happy knees in the end. Be well, do good, walk humbly! This entry was posted in Trail Log on March 8, 2018 by blogginggazelle. The magazine blogs with the “Top Ten Bucket List Hikes” usually mention the John Muir Trail like it’s something you decide to do tomorrow. I’m spoiled here in Tennessee because we can actually decide to take a hike the next day in the Smokies and just go… most of the time. But our national parks are being loved to the point of overuse and high impact. Crowd control, even in the back country, becomes a necessary evil. Such is the case with the John Muir Trail in Yosemite. The Park Service and the US Forest Service have an impossible task. With serious under-funding, they have to find a way to manage millions of visitors while trying to maintain the integrity of the wilderness experience, not to mention the wilderness herself. And so they implement controls and bureaucracy. Perhaps the most difficult part of hiking the JMT is actually the permitting process and the blogs fail to point that out beyond a brief mention that you can apply for your permits six-months in advance. 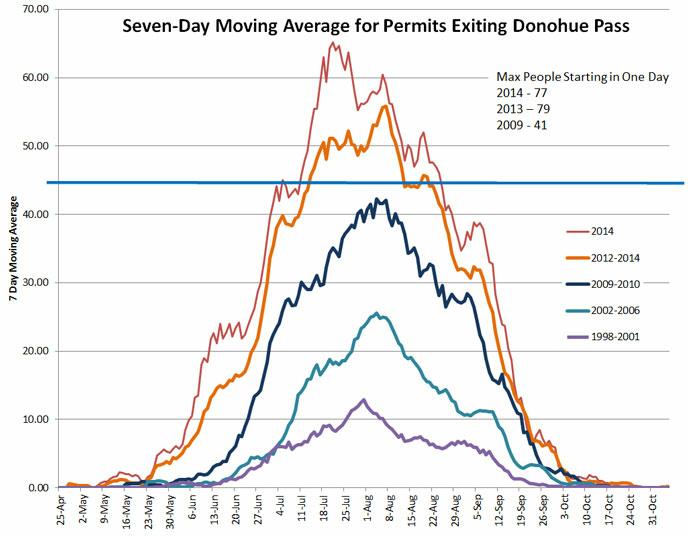 The National Park Service issues 45 permits a day to exit Donahue Pass. During my efforts I was told by the Park Service that the chances of getting a permit in advance for July are about 5%. I have an email folder with no less than 32 denied permit requests. The other option for Yosemite is to show up the day before you want to start your hike, hoping to get one of 10 walk up permits issued each day. That guy five people in front of you getting permits for a group of 6 means you’re done. A JMT hiker named Sprout shared her experience with the walk up permit process. on The Trek. Other options include hiking north from Mt. Whitney, getting a 500 miler PCT Permit, and the option I chose, starting the JMT about 3 miles south of Donahue Pass in the Ansel Adams Wilderness. The permitting process is perhaps no less onerous but at least your odds of securing a permit are much greater. Permits outside Yosemite are managed by the Inyo National Forest The trick here is you have to apply for an entrance permit AND and exit permit if you are going to exit at Whitney Portal. Just like Yosemite, you can apply up to six months in advance. Permits are limited, especially for Whitney Portal, but their availability is much greater than the Yosemite permits. The Rush Creek trail joins the John Muir Trail just 3 miles south of Donahue Pass and as of early-February, there were plenty. The exit permits for Whitney Portal were more of a challenge and I should have applied a couple weeks earlier, but luck was with me and I secured an exit date. If Whitney Portal permits are not available, one option is to hike past Whitney Portal to the next trailhead 35 miles south. The Yosemite permits do not require an exit permit for Whitney Portal. IMPORTANT TIP: The Recreation.gov website that manages the permits for the USFS gives you a limited amount of time (5 minutes or so) to complete your permit request. The JMT Trail requires 15 – 20 days to complete and the website requires a specific location for every camp. So you get your start and end date and then you begin inputting your camping nights when the website times out. 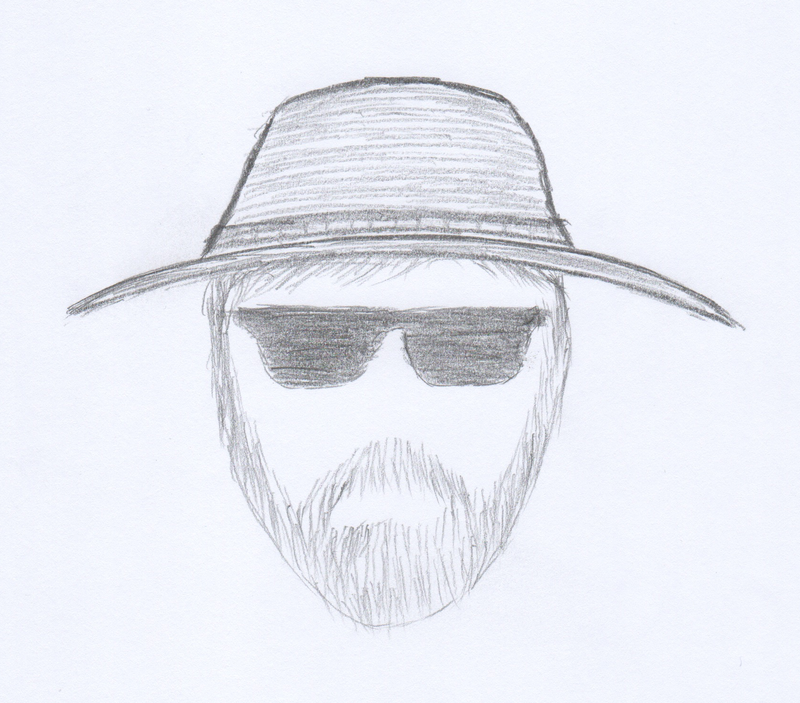 After three attempts and pulling part of my beard out in frustration, I called the Inyo Forest Service Permit Office. They were sympathetic and gave me a clue. The website does not have any logic about your camping schedule between start and exit. All you have to do is put anything in those fields, pay for and submit your permit request, and then fix the schedule later. So now the plan is to day hike sections of the JMT in Yosemite. But even if you simply must start your hike in Yosemite, I would still have the Forest Service Permit ready so if the walk-up strategy fails, you have a backup. Just make sure to cancel your Forest Service permit if you happen to get one of those rare 10 passes. I think I’ll sleep in that day and just go with my Inyo permit. This entry was posted in John Muir Trail on March 3, 2018 by blogginggazelle. The forecast for Friday was 76 degrees, 10% chance of rain and 59% humidity. It was for FEBRUARY 23!!! I have no illusions that winter won’t try one more kick but this day was made for hiking and there were no meetings scheduled. I got a really late start, which for me is unusual. Normally I am on the road by 7:00 and on the trail no later than 9:00 but that day I slept in and hit Big Creek around 10:30. I really love the east side of the park. It is more remote and less visited. 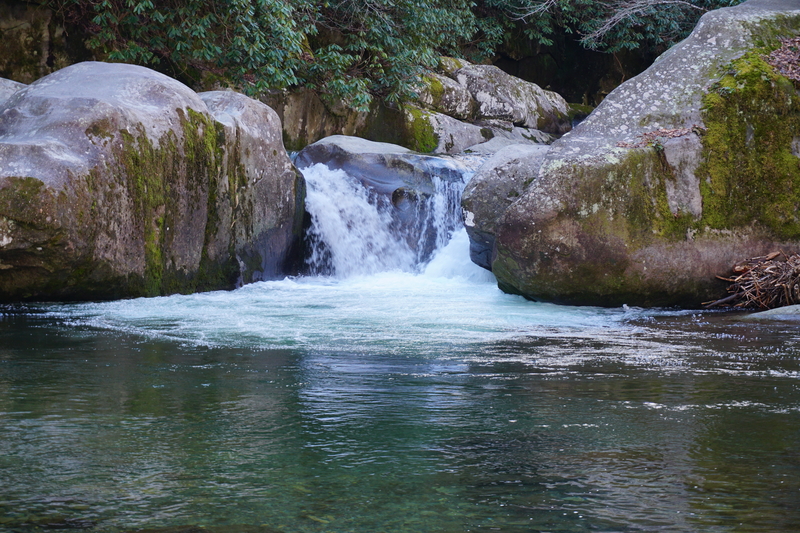 The big attraction for Big Creek is Midnight Hole for its swimming but there would be none of that in February. That said, the parking lot had about 15 cars despite the facilities being locked up tight. There was not even a trash can to be found. The route for the day was Big Creek Trail to Swallow Fork Trail to Mount Sterling Ridge, Mount Sterling Trail to the tower and back down Baxter Creek. I chose that order because I figured the 4,00 ft climb would be easier spread over 11 mile than the 6.2 up Baxter Creek. I was right! The Big Creek Trail has to be one of my favorites. It follows its namesake all the way to Walnut Bottom, which is one of my favorite camping areas. The hiking is easy and the creek offers one who saunters its surprises and gifts. the trail is a wide gravel path its entire length and the 4.7% grade is quite friendly as ascents go in the Smokies. The views of the creek all along the path are spectacular. There are many opportunities to take in a cascade. Midnight Hole is at 1.4 miles. This is a popular swimming hole in the summer attracting visitors sporting swim suits and flip flops in sharp contrast to those in hiker garb. But Today, there were only a couple other hikers taking in the morning and I had Midnight Hole to my self for a few “peopleless” pictures. 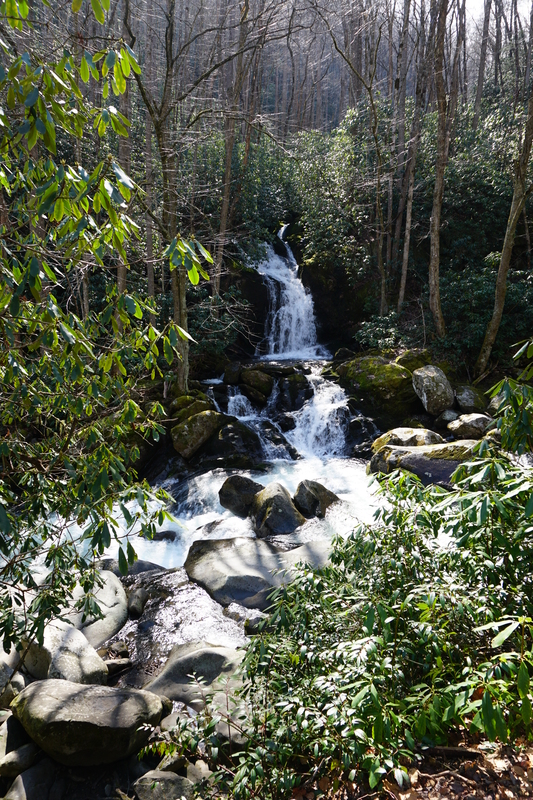 The lovely Mouse Creek falls is a mere half mile ahead and is a great place to pause and enjoy a concert of water music. The sun was high over the falls reflecting back a wash of white light but a couple suitable pictures were captured. Big Creek continues on another lovely 3.2 miles to Walnut Bottom and Campsite #37. I have a really fond memory of a night spent in CS#37 back in July of 2016. As I drifted off to sleep, I awoke later in the night to this bright flashing of light coming through the tarp of my hammock fly. Wondering why there might be a vehicle this far up the trail spurred me to exit my cocoon and to my utter surprise and amazement, it turned out to be the synchronous fireflies the Smokies are world famous for. There were no crowds, no shuttles to Elkmont, no noisy people, no traffic. Just thousands of fireflies that somehow manage to blink in unison for several seconds before the rhythm breaks down. And then someone gets it going again and they all chime in. I wish the bands I have played in were this tight. There is a wide bridge over the creek in Walnut Bottom. I enjoyed my lunch near the bridge down at the side of the creek. Swallow Fork Trail leaves Walnut Bottom and heads 4 miles up to Pretty Hollow Gap on the Mount Sterling Ridge Trail. The climb is no longer easy at this point gaining 2,200 feet in 4 miles at a 10% grade. There are 4 stream crossings starting with a footlog over Swallow Fork on the route, none of which involved a wet ford. The climbing is mostly steady. The trail is pretty brushy in places but clears up about a mile in becoming a nicely graded single track. There is much winter greenery including moss along the fallen trees and rhododendron. At around 2.7 miles, the climbing turns from steady to strenuous, which is a wake-up call for legs that have had a long winter off. The trail leaves the company of the Fork at about 3 miles and turns up the ridge. The stillness surrounds you with an occasional bridsong for entertainment as you continue the climb. At 4 miles, you enter Pretty Hollow Gap where I enjoyed a brief nap in the warm February Sun. The gap has some briar growth in the summer but there is still plenty of cool grass to stretch out upon for a welcome break after all the climbing. The Mount Sterling Ridge Trail runs through Pretty Hollow Gap and my route turned left heading along the ridge to Sterling Mountain. The ridge is blessed with conifers along the top. The first 0.4 miles is uphill, then levels off for a half mile and then heads steady up to the Mount Sterling Trail. The route heads northeast a quarter mile to the tower and Campsite #38. Mt. 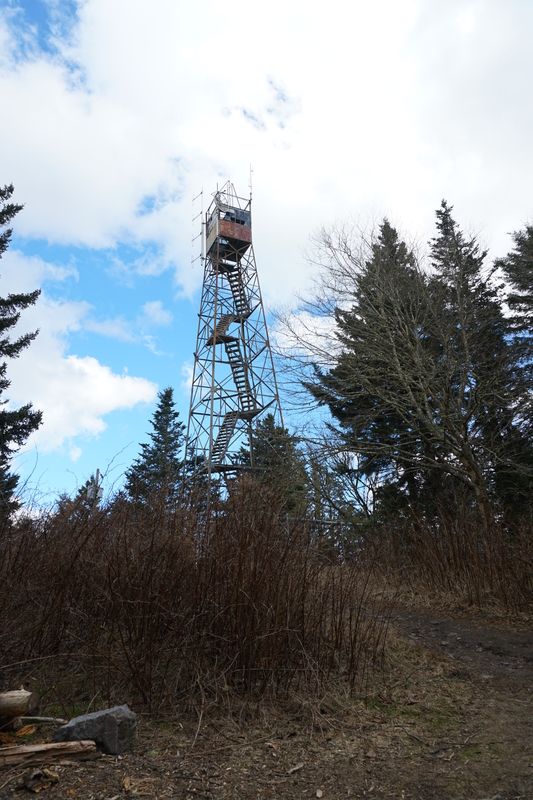 Cammerer gets all the press for a great lookout view but Mount Sterling tower is a well kept secret. Surrounded by fairly dense Fraser fir trees, the site is also home to Campsite #38, which is another bucket list campsite I have yet to enjoy for a night. But I do plan to return soon. The view from the fire tower is spectacular, even better in my opinion than Mt. Cammerer and the reward is even greater knowing one has to earn the view. After many pictures from the tower and a good break and a stretch of the legs, It was time to find Baxter Creek Trail and head back to Big Creek. The descent down Baxter Creek Trail is stark and wastes no time. The trail descends 4,000 feet over 6 miles for a 12% grade. Not the steepest but it is a steady 640 ft. per mile drop. After 11 miles of climbing, it is still a physical challenge heading downhill. 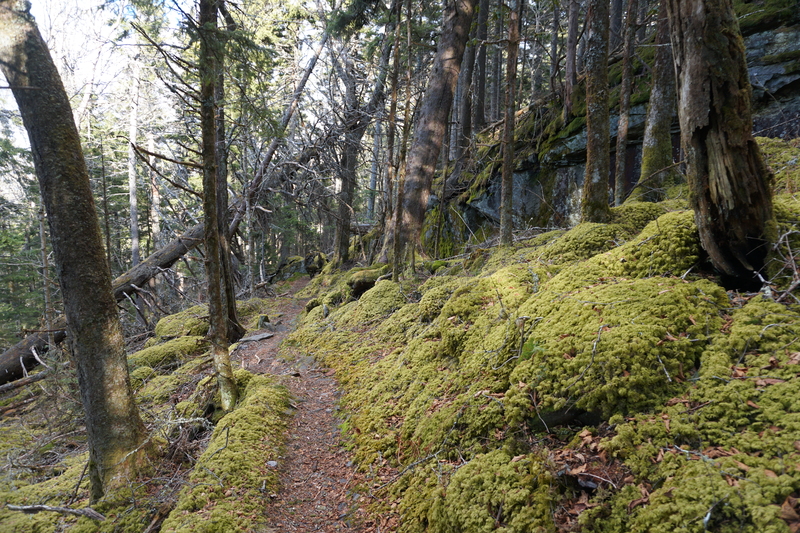 The only charm of Baxter Creek Trail is the Middle Earth quality of the dense fir trees and the heavy green moss that carpets the ground. The water source for CS#37 is about a quarter mile down as the trail continues its descent. Fortunately, the trail is not very rugged. About a mile down, rhododendron show up but the conifers are still in firm control of the landscape. Along this section there are the standing skeletons of huge hemlocks that the Creator has not yet given permission to fall. Large conifers are the old men of the Smokies, keeping watch over the centuries and it is sad to see so many will fall in the next time but the cycle of life continues as the mos and new growth spring forth from the giants once they rest on the ground. The conifers leave you by the time you are 2 1/2 miles down Baxter Creek Trail. With 57 years old knees, I find that steep downhills are less efficient than ascents. My rate is about 2.5 miles per hour and while the heart rate is less, the legs (knees) control the speed. There are few landmarks along the remainder save a switchback and a bend here and there. At 4.3 miles the sound of water music encourages you to pick up the pace toward the end. The descent levels a bit and the walking becomes more pleasurable. At this point, I noted that the most exciting aspect is watching the GPS count the mileage. About a quarter mile from the end, one can make out the pathway from the campsite across Big Creek until finally, the bridge comes into view and you cross over to the parking area. It’s always good to get back to the car before dark although it was a bit too dark for a picture of the Creek from the bridge. But I’ll be back! It’s an hour drive back to Knoxville and burger at Aubry’s. This entry was posted in Uncategorized on February 26, 2018 by blogginggazelle.